When we built our first house, we had walk-in closets in every bedroom, with plenty of built-in drawer and hanging space, thus eliminating the need for dressers. 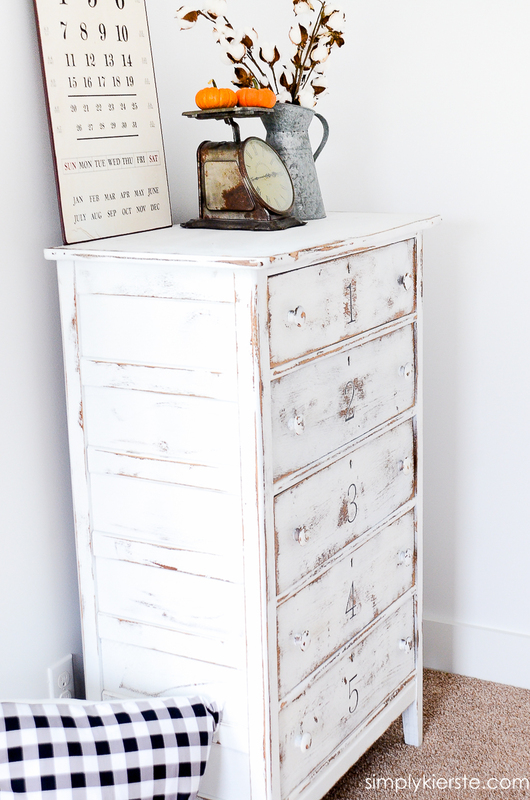 A few years down the road, that is no longer the case, so I found myself needing to find dressers for every one of our bedrooms before we moved into Old Salt Farm. Months ago I started hunting at Habitat Restores (I stalked them for months), plus garage sales, and anything I saw on the side of the road. I eventually found all the dressers I needed, and a few weeks before we moved in, I refinished them all, and gave them a dresser makeover. I’m going to show you a couple of the ones that I did, because I refinished them the same way. One is in my room, and the other one is in my three year old’s room. I absolutely adore them both, and love how they turned out. Best of all, it was very easy to do! LOVE LOVE LOVE! 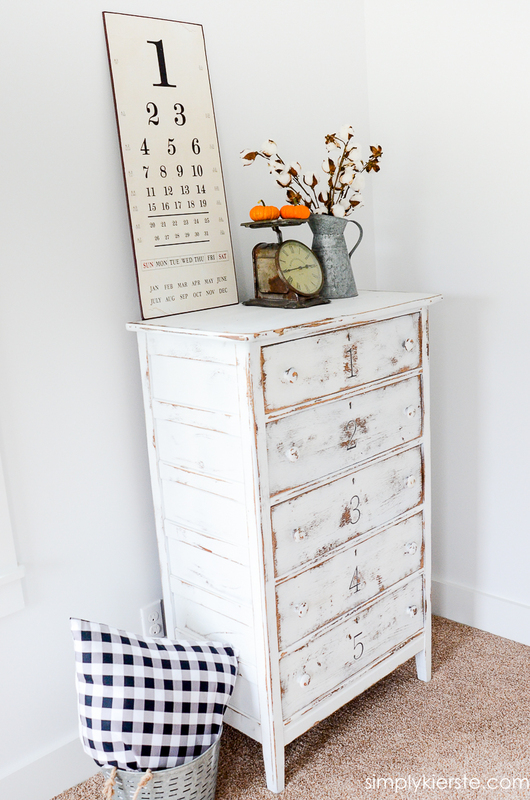 It’s totally perfect for this little corner in our master bedroom, and I think the numbers are the perfect touch. I don’t have too many process photos–I’m not sure what happened to them–but this was a very basic makeover, with very few supplies, and nothing fancy. 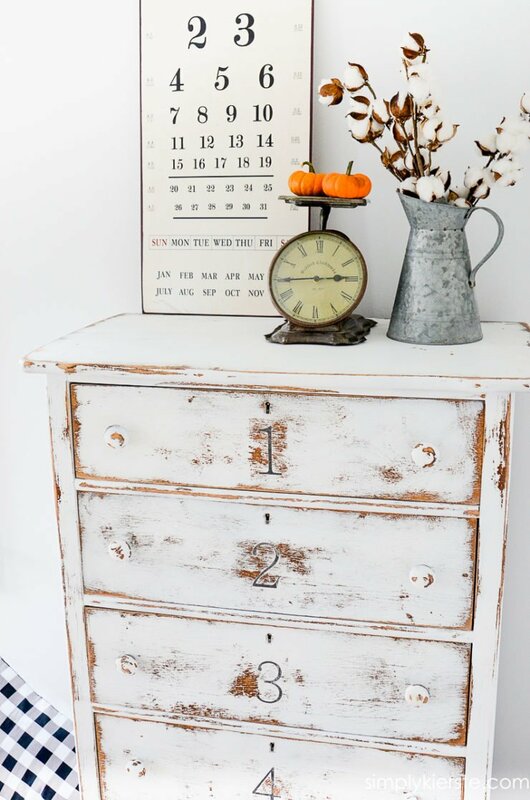 There are lots and lots of ways to give furniture a distressed and weathered look, but honestly, I always go with the easiest. It’s probably partly because I’m impatient, and partly because I’ve tried many other techniques, and I’ve decided the simplest is best for me. If you’re starting out with a solid wood piece, then this is for you! *Set up your dresser/furniture on a large tarp, legs off of the ground. I like to put blocks of wood underneath each and, or under each leg. 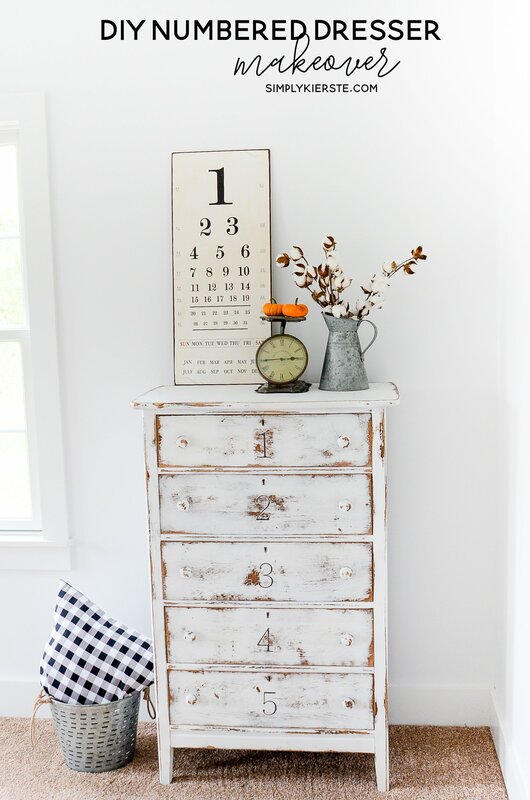 *Prep your piece as needed–rough sand, cleaning, remove drawers and hardware, etc. I didn’t have to do much for this one–it was in good shape, and it didn’t any sanding. I wiped it down really well, then let it dry. *Paint your first coat! I like using different kinds of paint on different projects, and this time I used a latex paint–primer and paint in one. I used a paint sprayer, which made it go super fast. I painted three pieces of furniture in about 45 minutes! I did one coat, let it dry, then did another coat. Since I was going to distress it, that was good enough. If you don’t plan on distressing, another coat might be necessary. 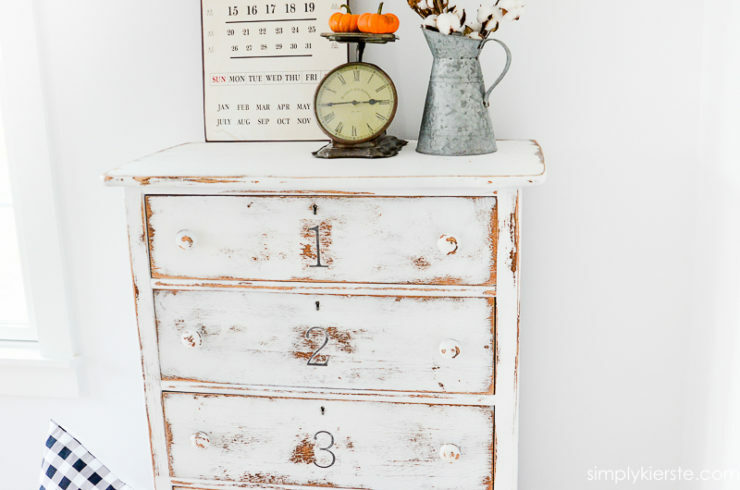 One method for distressing is using Vaseline–putting some on your finger and wiping it on corners and anywhere you don’t want the paint to adhere, BEFORE you paint. I have used this quite often, but I didn’t on this piece. I didn’t want the distressing to look too “clean”, and in the end, I’m glad that’s what I did. It certainly is an option though, and it’s SUPER easy to do. Once you’ve painted and the paint has dried, you just wipe off the Vaseline and the paint comes right off! *After the paint had dried, I used stencils I cut out with my Silhouette and applied them to each drawer. If you are going to do the same thing, I highly recommend using the removable vinyl–the other kind might stick to your dresser and peel off all the paint along with it when you remove it. I actually like using spray paint to add the numbers on–it stays much better and doesn’t sand off as easily as craft paint, and uses less coats. I spray it on a paper or plastic plate (not foam! ), then use a foam brush to apply it. I have to spray the paint several times on to the plate, and it takes quite a bit of spraying each time, but I’ve done this for years, and still love it. *Once the numbers have dried, sanding is next…and this is where the distressing comes into play. I took my sander with medium grit sandpaper and went to town on the edges, fronts, top, and pretty much everywhere. I really wanted a lot of the wood to show through. I went over the numbers enough to fade them, but just enough. *Wipe down all the excess dust, and put your hardware back on. Thank you!! I actually cut out the numbers with my Silhouette Cameo, a vinyl cutting machine! Hi Kierste! :) This may sound odd but do you do anything to the insides of the drawers? Thanks! So cute! What a fun and easy-ish project. The photos of your home look like they are straight out of a magazine. This is amazing! I love how it turned out.